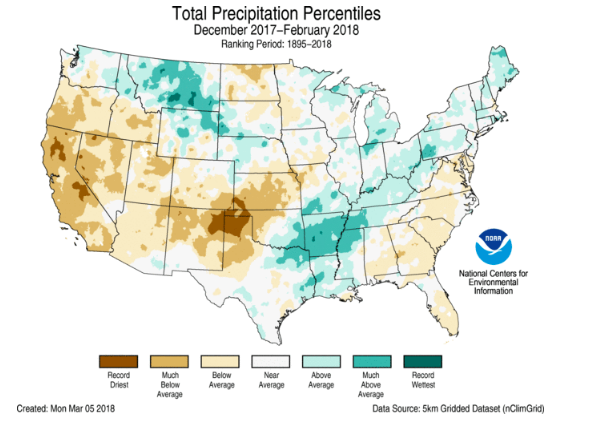 The winter of 2017-18 brought a variety of winter weather to different parts of the US at different points during the season and a few surprises as well. It featured some wild Nor’easters, Southern snowstorms, wicked cold and snow in the Northern Rockies and a mild, relatively low impact winter for much of the West. Recently researchers have developed an index to rank the severity of the winter at locations around the U.S. The Accumulated Winter Season Severity Index (AWSSI) was developed to objectively quantify and describe the relative severity of the winter season (Boustead et. al 2015). AWSSI uses a set of parameters to that are readily available throughout the U.S. observation network. The severity of a winter is assessed through the intensity and persistence of cold weather, the frequency and amount of snow, and the amount and persistence of snow on the ground. This past winter’s assessment confirmed some big differences across the nation. A couple of patterns stand out. The Southwest barely had a winter. In fact, Flagstaff AZ had its mildest winter on record, based on AWSSI. Figure 1: Automated Winter Season Severity Index (AWSSI) through May 4, 2018. 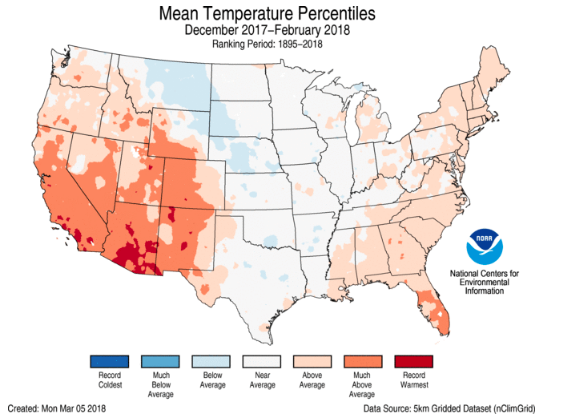 The Southwest overall had a Mild winter, but the rest of the nation saw Average to Severe and in some cases Extreme winter. Flagstaff, and the Southwest overall, was under an upper air ridge for much of the winter, translating to a warmer and drier season. It was Flagstaff’s 5th warmest winter on record and total precipitation was only about ½ what they normally receive. As a result they had a snowfall deficit of a whopping 63.2”! In contrast, much of Montana experienced one of their worst winters on record with a combination of bitter cold temperatures and significant snowfall, resulting in 3 of the 4 AWSSI sites achieving an Extreme” ranking. Not surprisingly, the national map of the winter average temperature and precipitation matches up well with AWSSI rankings. After a couple early season snowstorms in early November, the timeframe through mid-December was pretty quiet for the North. We may not have gotten much winter in the North, but we sure had our share early on in the South. Winter Storm Benji (full write-up in Part II) from December 5th through 10th was our second named storm of the season, hammering the South with heavy wet snow that produced extensive power outrages to hundreds of thousands of customers. Corpus Cristi, TX recorded 6” of snow with thundersnow at times. Just west of downtown Atlanta as much of 13” of snow fell, knocking out power for several days. Benji was the first winter storm of meteorological winter but not the last to hit the South. 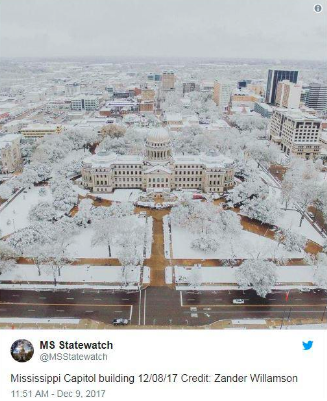 It was followed in January by Grayson, Hunter and Inga that brought a combination of snow and ice to the Gulf Coast states from Texas to the Panhandle of Florida. Many people in the East will remember the holiday period marked by December 24th through January 7th for its extended period of very cold weather. When the daily temperatures were averaged for that period, it was one of the coldest on record in many Eastern US locations. The culprit was a broad western ridge-eastern tough across the US during that timeframe and locked in the cold conditions. 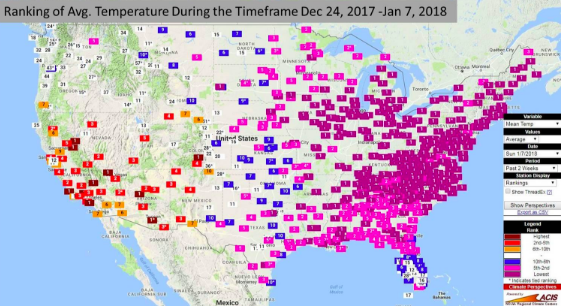 Figure 3: Ranking of the average temperature during the timeframe Dec 24, 2017 through Jan 5, 2018 across the U.S. For many locations east of the Mississippi this was the coldest year for that range of dates on record. Chicago, Boston and New York all recorded their 5th coldest New Year’s Eves on record. Chicago had their 2nd coldest New Year’s Day on record at -9°F. Minneapolis cracked the Top 10 Coldest New Year’s Day at -14°F. During the entire 2-week stretch, the average daily temperature in Chicago was 6.6°F or 18°F below normal! 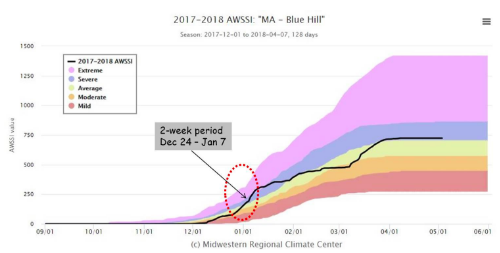 The extended period of cold temperatures drove the AWSSI scores for many eastern cities into “severe” winter categories as exemplified by Blue Hill MA near Boston. Boston had an average temperature for that timeframe of 14.4°F or 16°F below normal. Figure 4: AWSSI chart for Blue Hill MA. The outlined area shows the slope of the curve during the 2-week cold air outbreak, which led to the AWSSI score getting into the “Extreme” winter range during early January. Three Named Winter Storms were spawned in that cold air, culminating in Winter Storm Grayson, a very strong Nor-easter during Jan 2-5, that brought snowfall from South Carolina and Georgia all the way up the coast to Maine (see Part II for details). In fact, the central pressure in the Low associated with Grayson dropped an extraordinary 59mb in 24 hours, one of the greatest pressure falls for a Low in that part of the Atlantic Basin at any time of the year!! Figure 5: January 4, 2018 GOES-16 image of Winter Storm Grayson as it headed northeast along the coast of the U.S. Notice the swath of snow cover from Southern Georgia through the Mid-Atlantic in the wake of this storm. I don’t think anyone would argue the fact that the Northern Plains through Upper Midwest and U.P. of Michigan experiences some of the most severe winter conditions in the CONUS. 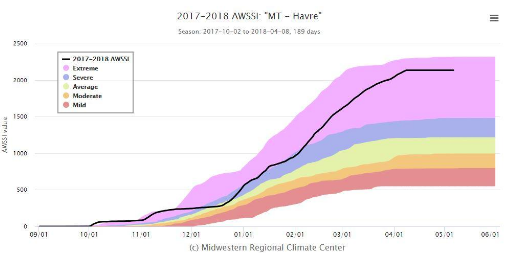 It is worth noting then when places like Havre Montana experience some of the coldest “late winter” conditions and greatest snowfall since records began back around 1940. The average temperature for the 3-month period from February through April was 20.3°F, the third coldest since records began back in 1880. In February, the average monthly temperature of 1.5°F was 20.7°F below normal! Coupled with several favorable winter storm tracks that dumped enough snowfall to make this the snowiest winter on record since those stats began being recorded in 1940, and it added up to an “Extreme” AWSSI winter overall. Figure 6: AWSSI for Havre MT. The combination of an extended period of very cold weather plus record snowfall put this location near their most “Extreme” winter on record. It really isn’t BIG news if the northeastern part of the nation gets visited by 4 Nor-easters in any given winter. It isn’t necessarily unrealistic to see 4 Nor-easters in any given winter month. 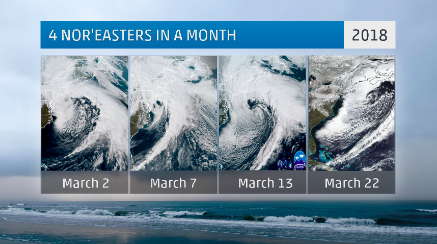 However, when 4 Nor-easters occur in March, then that’s big news! That’s just what happened this year as the overall large scale weather pattern locked into a favorable setup for rapidly developing Low pressure systems along the New England Coast. A significant blocking pattern developed near Greenland as reflected in a very strong a prolonged North Atlantic Oscillation (NAO). 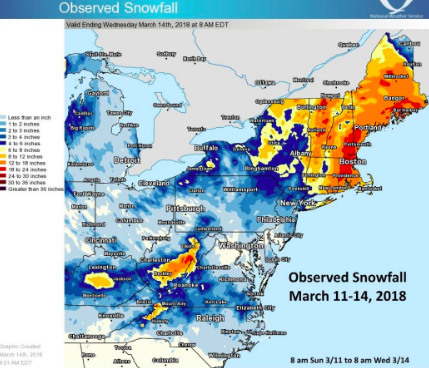 As a result of that favorable pattern for Northeast snowstorms, in about a 3-week period from March 1-22 the Northeast was pummeled by Riley, Quinn, Skylar and Toby, each with its own personality/impacts. 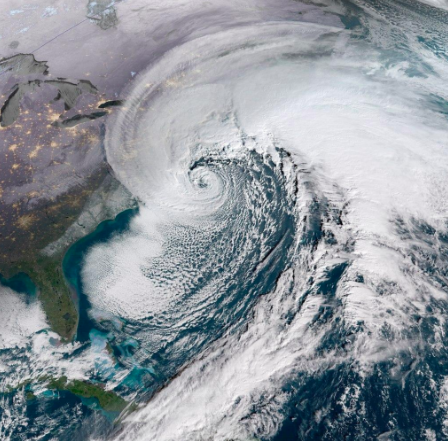 Figure 7: Stunning satellite images of each of the 4 Nor-easters that hit the U.S. during the month of March. 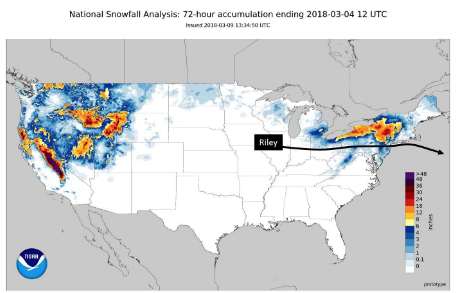 The first storm to hit was actually Riley, yes it developed later than Quinn, but Quinn had a history that went back more than a week as it first began to impact the West Coast of the U.S. So, while Quinn was roaring through the Rockies as a named storm, Riley spun up over the Ohio Valley and made a beeline for the East coast. 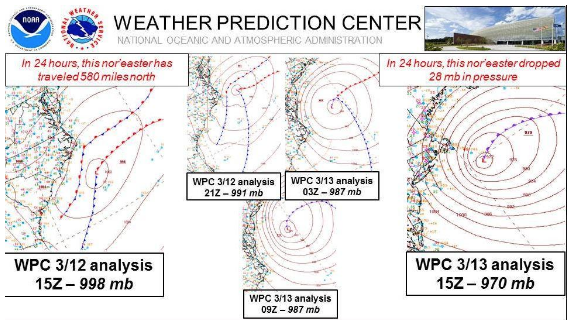 As Riley moved offshore near the tip of Eastern Long Island, it underwent “bombogenesis”, explosively deepening 26mb in just 21 hours, meeting the definition of a 24mb drop in central pressure in 24 hours . Rather than moving north along the New England Coast, it headed east then southeast where it stalled well out to sea. The track however was very favorable for extreme winds over Cape Cod, where 4 separate stations recorded wind gusts in excess of 90 mph !! Six states had wind gusts in excess of 70 mph, Boston harbor had its 3rd highest tide in history, coming less than 2 months after Grayson produced the highest tide on record. Scituate MA had extensive damage from coastal flooding. Nearly 40” of snow fell somewhat inland over New York’s Catskill Mtns. 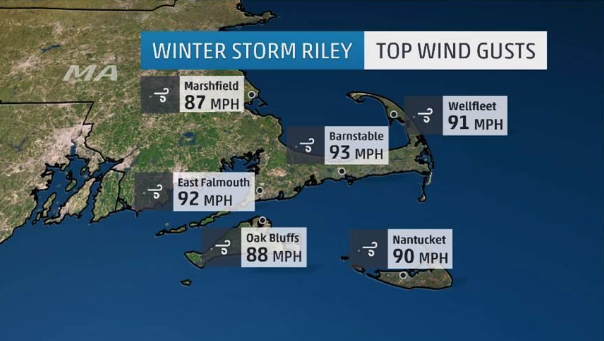 Figure 8: Top wind gusts from Winter Storm Riley along the Cape Cod Area of New England. Quinn was next to strike. 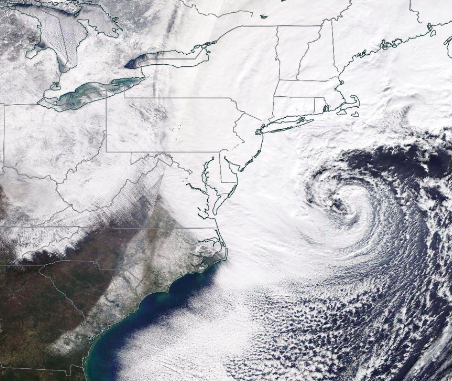 Phase I of this cross-country storm weakened as it moved through the Great Lakes, then Phase II dramatically deepened just off the Carolina Coast and tracked northeast along the New England Coast. As a result, very heavy snowfall and strong winds pummeled coastal and inland sections from Northern New Jersey to Maine. Five states reported more than 2 feet of snowfall and winds gusted to near 60 mph in parts of coastal New England. That combination of wind and snow led to hundreds of thousands of customers without power. Figure 9: Interpolated snowfall totals from Winter Storm Quinn (courtesy NWS). Next up in the Nor-easter onslaught was Winter Storm Skylar. Another storm that met “bombogenesis” criteria, Skylar dropped its central pressure 28mb in 24 hours. Another two-phase snowstorm, Phase II of Skylar developed off the Carolina Coast and took a track just outside the “benchmark” (40°N 70°W)allowing for cold air to make it all the way to the coast in New England. As a result very heavy snowfall accumulated in places like Boston, Providence and Portsmouth. Blizzard conditions impacted 10’s of millions including New York City, Long Island, Boston and other parts of Southeastern New England and on Long Island snowfall rates exceeded 3” per hour. Parts of 7 states recorded at least 20” of snowfall. With cold air locked into the Mid-Atlantic region ahead of the storm, snow accumulated all the way down through North Carolina. 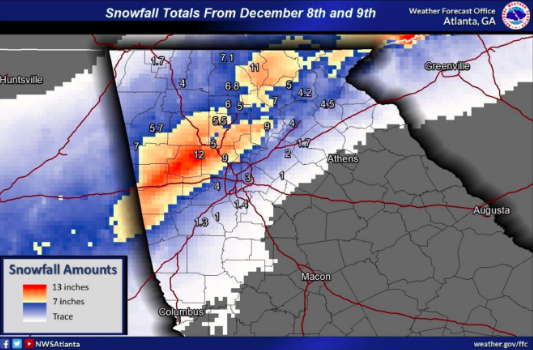 Figure 10: Snowfall totals from Winter Storm Skylar (courtesy NWS). Finally, rounding out the quartet of Nor’easters was Toby. This Nor’easter took more of a southern track in two phases once again, the first through the Central Appalachians, then Phase II was coastal development off the Delmarva peninsula and a track to the east of Cape Cod. As a result of the more southern track, the first day of Spring provided the 2nd heaviest late season snowstorm in Harrisburg PA (14.2”) and heaviest Spring snowstorm in 60 years in Philadelphia (7.6”). Washington DC saw 4-6”, their heaviest snowfall of the season. Enough cold air was in place over Kentucky so that Phase I of this storm dropped nearly a foot of snow in the suburbs of Louisville as well. Their average annual snowfall in Louisville is 13.6”. Once again the combination of heavy, wet snowfall and strong winds from this Nor-easter resulted in power outages to over 100,000 customers. Coastal flooding was also reported yet again in Scituate MA. However, because of exceptionally dry air over much of New England, there was not much snowfall there. Figure 11: Snowfall totals from Winter Storm Toby (courtesy NWS). Most people are familiar with the term “April Showers” and for a good portion of the U.S. April can spell the beginning of Spring. However, for much of the Plains through Upper Midwest and Great Lakes, April 2018 was anything but spring-like. A large scale “blocking pattern” set up across North America in late March and it locked in through most of April. That pattern featured a combination of a deep Low over Eastern Hudson Bay and a semi-permanent High over Central Canada that directed very cold air down across the center of our nation. In fact, the April average temperature rankings by state for April tell a chilling story. Note that both Wisconsin and Iowa had their coldest April on record and 8 adjacent states had their second coldest April on record. 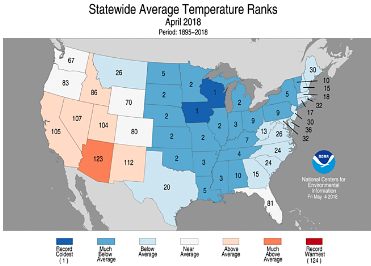 Figure 12: Statewide average temperature rankings for April 2018. Three successive storms, Violet, Wilbur and Xantho, tracked from west to east across the U.S. in April. 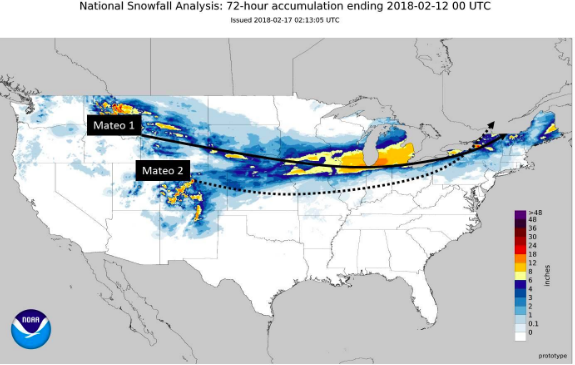 As they tapped that cold air to the north of them, three high-impact snowfalls hammered portions of the Northern Plains through Upper Midwest. Before it was all over, places like Green Bay Wisconsin had their snowiest April on record. In fact, NWS reports confirmed that no less than 130 locations across Wisconsin set records for April monthly snowfall. A few locations in Northern Michigan also had their snowiest April on record. The 36.1” that piled up in Green Bay far surpassed the old record of 15.1” set way back in 1906-07. The most significant snowstorm during that month was Winter Storm Xanto, which dropped 24.2” of snow on Green Bay making it the 2nd greatest snow total on record in any month. The 15.8” that fell in Minneapolis made it the greatest Aprils snowstorm there. Figure 13: Storm Total Snowfall from Xanto across portions of the Upper Midwest. – Erie PA set its all-time snowfall record, coming in with 198.5” of snow. Much of that came during an epic 3-day lake-effect snowstorm in December that produced over 5 ft. of snow!! – Caribou ME had snow on the ground for a 137 day stretch, ending April 25th, though a long time, it is far from the record 155 days and even well behind the 2016-17 length of 140 days. – The Southwestern U.S. suffered through yet another dry winter with increasing drought conditions in particular across the 4-Corners Region, where Exceptional Drought expanded significantly. All in all the winter of 2017-18 produced a variety of high impact winter weather. The Southwest continued its streak of warm and relatively dry winters, something we seem to be seeing more of lately. The South got its share of winter weather with a number of impactful snowstorms. Across the Northeast, a hope for an early spring was dashed by 4 Nor-easters during March. Even worse, for the Plains through Upper Midwest, relentless cold weather in April dashed any hopes of early spring and a reminder that, to quote Yogi Berra, that great American Philosopher and pretty good baseball player, “it ain’t over til its over”. Stay tuned for Part II of the summary which highlights each named winter storm of this past season. 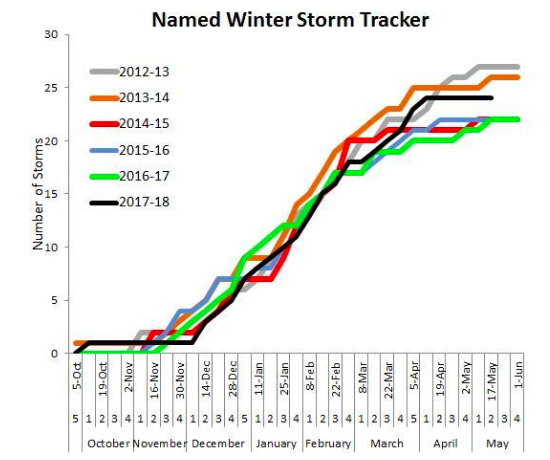 Below is the graph of the dates for named storms for the past 6 years The Weather Channel has been naming winter storms. 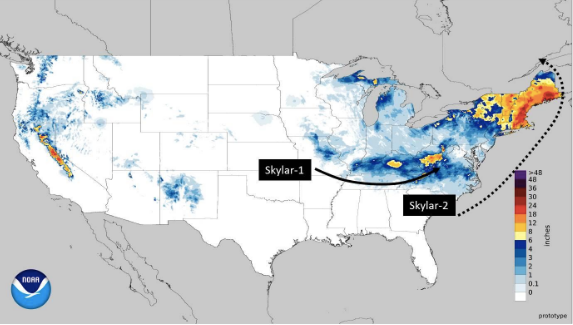 It is amazing when one looks at the rate at which storms have been named each season, which is based on the objective criteria of at least 2 million population or an area of at least 400,000 sq. km. either under or expected to go under NWS Winter Storm Warnings. This past season the process started off quite slowly, after a named storm in early October, it took until the first week in December to get to our second named storm. However, from that point we didn’t look back, as storms were named at a rate of at least one a week through Mid-April, with only one break in early March. 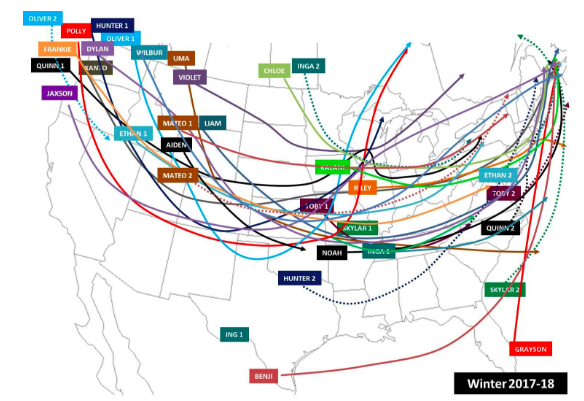 I have also posted the complete list of named winter storms with dates for the past 6 years. Compare the dates certain storms were named. Look at the “J” storms as an example. Notice how every single “J” storm was named within a week of each other! Many other letters follow the same pattern which brings up the question as to whether or not there is something more to the naming process or could it just be the way in which each winter is modulated in some way across the US? These are questions that will likely be pursued as we continue to name winter storms. Before we show each storm track and highlights I wanted to give you a look at all of the storm tracks for the 2017-18 season below. October 8-9, 2017 – The First Named Winter Storm of the Season, 1st accumulating snow to Denver, as much as 12.5” in Genesee CO, along the Front Range. 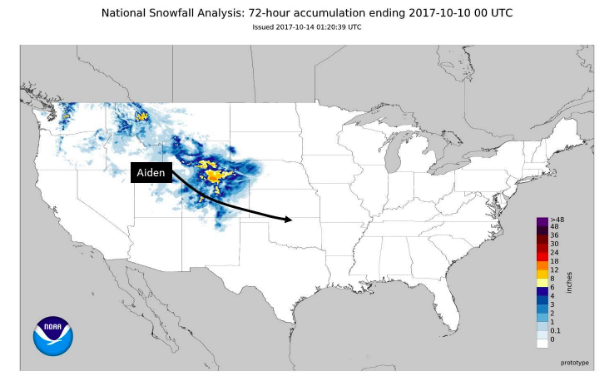 Aiden was a very early season snowstorm producing measurable snow in Denver, where their first measurable snow usually occurs in early December. As much as 15” of snow was reported in the foothills of the Front Range around Denver. Farther north in Wyoming, Cheyenne picked up 5.7” of snow and parts of I-80 in Wyoming had to close for a brief time due to dangerous driving conditions. December 2-5, 2017 – High impact snowstorm for the South with significant snowfall along all of the Gulf States. Power outages to hundreds of thousands in parts of the South. 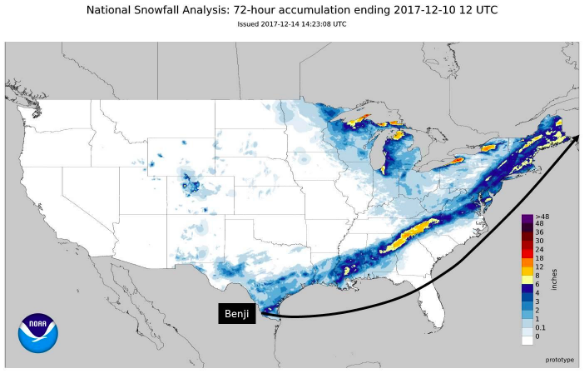 Benji was a major early season snowstorm for the South putting heavy, wet snow down along a swath from Texas to Florida, the Southern and Central Appalachians and even a portion of the Northeast. As much as 7” of snow was reported in Corpus Christi TX. Farther east 7” fell in Bay Springs, MS and 12” in Jacksonville AL. In Georgia 18” fell in Mountain City and around Atlanta there was a tremendous difference from the northwest to southeast side of the city. Even parts of the Panhandle of Florida received as much as 2” of snow. As Benji headed northeast up the Atlantic Coast, it dumped 25” of snow on Mt Mitchell in North Carolina, 9” in Cedar Mountain South Carolina and 2-6” in Eastern Tennessee. As the system continued northeast it produced 2-4” of snow in Washington DC, and in parts of New England as much as 6-8” fell. 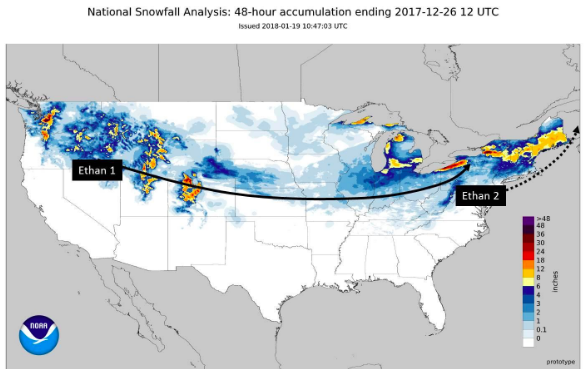 December 13-14, 2017 – Fast moving storm that dumped heavy snowfall from northern Wisconsin through the Great Lakes. 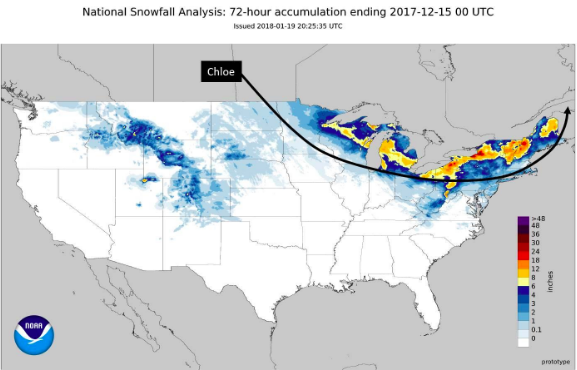 Chloe was a fast moving winter storm that dumped almost a foot of snow across a stripe of Lower Michigan. The storm began back across Wisconsin where Green Bay picked up their greatest daily snowfall in almost 2 years, accumulating 7.1” on the 13th of December. Detroit recorded 6.3” of snow, their second highest daily snowfall total for the entire winter of 2017-18. Note the heavy, mesoscale lake-effect snow that occurred immediately downwind of Lakes Erie and Ontario was lake-effect snow, indirectly related to Chloe. 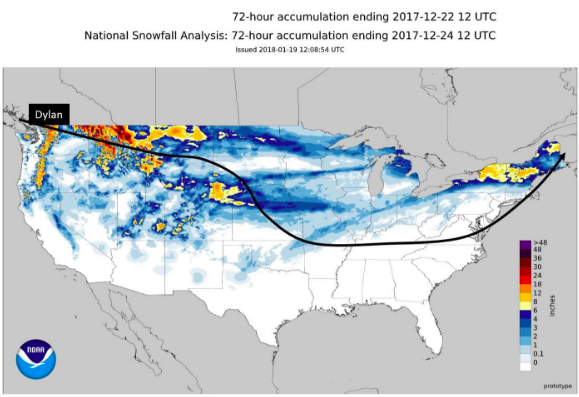 December 20-23, 2017 – Long track winter storm that dumped very heavy snowfall through the Northern Rockies and Plains, light to moderate snow across the Upper Midwest and finally a combination of heavy snow and significant icing for the Northeast. As Dylan came onshore in the Pacific Northwest, it produced strong damaging winds around Bend, OR. I-90 trough Snoqualmie Pass had to close a couple of times for snowy roads. Dylan produced very heavy snowfall across the mountains of the West, where Glacier National Park had a storm total 40” of snow! Across Northern Idaho there were a host of power outages from over a foot of heavy, wet snowfall there. As the system headed eastward across the Plains, it dumped up to 6-9” of snow from North Dakota through Minnesota. Arguably, the biggest impact from this storm was in the heavily populated region of the Northeast. A combination of cold air at the surface and a tongue of warmer, moist air aloft set up a perfect atmosphere for freezing rain. Across parts of Connecticut and Massachusetts, as much as 1/3 to ½” of ice accumulated in the morning of the morning of the 23rd, causing numerous traffic accidents and knocking out power to over 20,000 customers. 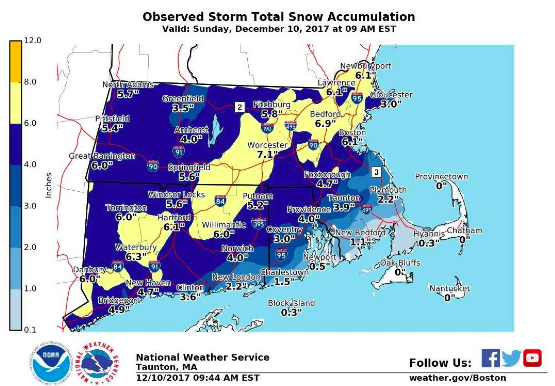 December 23-25, 2017 – Another long track snowstorm that brought quite a combination of strong winds and heavy snow on Christmas Day to New England. Ethan began its wrath out across the Rockies where it dumped over a foot of snow through Christmas Eve. The snow blanketed parts of the Plains from Kansas and Nebraska through Missouri as well on the 24th. As the storm headed for the East Coast, it strengthened rapidly late Christmas Eve into Christmas morning. Snow came down at rates exceeding 1” per hour in Bangor, Nashua, Hartford and Albany. The storm moved fast so impacts did not last that long but Blizzard Warnings on Christmas Day !! Yes, the combination of heavy snow and strong winds as the storm was exiting the coast produced blizzard conditions for a time in parts of southern Maine and coastal New Hampshire. Even thundersnow was reported in Down East Maine Christmas afternoon, where snowfall rates briefly hit 4 inches per hour! Falmouth MA, no stranger to strong winds this past winter, recorded a wind gust of 73 mph and 10,000 customers lost power. What a way to spend Christmas Day!! December 28-31, 2017 – Cross country storm that produced very heavy snow in the mountains of the Northwest and Northern Rockies. Frankie buried parts of the northern Rockies and Pacific Northwest with as much as 2-4 feet of snowfall. Saint Mary MT reported 4 feet of snowfall from Frankie over a 2-day period. Snow came down so heavily it triggered a few avalanches in the Montana Rockies. In northwestern Washington state a combination of cold air at the surface overrun by warmer, moist Pacific air yielded over an inch ice accumulation. That icing, combined with strong winds led to power outages for thousands. 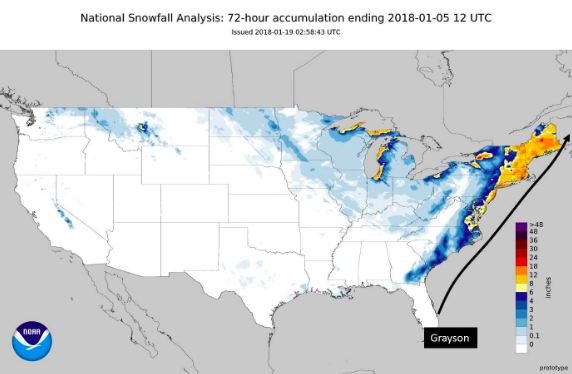 January 2-5, 2018 – Arguably the highest impact winter storm of the 20176-18 winter, Grayson brought high impact winter weather in the form of heavy snowfall and damaging winds to a large swath of the East Coast. To begin with, Grayson was one of the most intense winter storms for the Western Atlantic in decades. The central pressure of this system easily met the criteria for bombogenesis (24mb drop in 24 hours), as it dropped an amazing 59mb in a 24-hour period to a central pressure of 950mb (28.05”) January 4th. In comparison, some recent major Northeast snowstorms including Nemo (February 2013), Juno (January 2015) and Stella (March 2017) only got down to central pressures in the 970mb range. The track of the system from off the Florida coast, northeast to the Gulf of Maine resulted in significant winter impacts along most of the US East Coast. Tallahassee, FL got their first measurable snowfall since 1959, ice and snow resulted in power outages to over 100,000 in parts of Georgia and northern Florida. Charleston, SC got 5.3” of snowfall making it the 3rd heaviest one-day snowfall on record. In North Carolinas, up to a ½ foot of snow fell over the eastern portion of the state. In addition however, winds over the Outer Banks topped 70mph in places like Kitty Hawk (The Wright Bothers would not have liked those conditions). After pummeling the Southeast, things really got interesting. 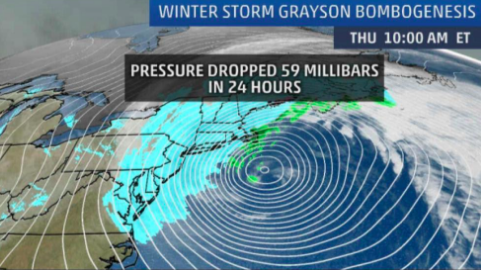 Grayson achieved bombogenesis as it moved from just off the North Carolina Coast to east of Cape Cod Wednesday night into Thursday, January 4th. In New Hampshire, 19.3” of snow fell near Bern. Bangor, ME got 18.3” but it was the combination of wind and snow that resulted in the most significant impacts. From Delaware through Virginia Tidewater, winds gusted to 60 mph. Norfolk was pasted with 10.3” of snow. Across New Jersey, as much as 18” of snow fell and was whipped up by strong winds to create blizzard conditions. Blizzard conditions were met in all large cities in Maine. Farther south Block Island, RI as well as many locations on Long Island New York City, the Lower Hudson Valley and southern Connecticut also met blizzard criteria, i.e. visibility at or below ¼ mile in blowing or falling snow with winds greater than 35 mph lasting for at least 3 hours. However, in terms of economic loss, the biggest impacts from Grayson had to be the record water levels and subsequent flooding along parts of the New England Coast, in particular Massachusetts, where those strong winds combined with high tide to produce multiple rounds of coastal flooding. Tide levels in Boston topped their all-time record from the “Blizzard of ‘78”. Cars were seen floating down flooded roads in Chatham, cars were stuck in a quagmire of water and ice in Quincy, and in Winthrop 75 homes were flooded to their first floors. The sea-wall in Scituate suffered damage and 2-3 ft. of eater swamped streets in Nantucket. MODIS satellite view of Grayson on January 4, 2018. Notice the snow cover footprint over the Southeast Coast in the wake of the cloud field associated with the storm. Snow and ice accumulation from Grayson that resulted in power outages to thousands across northern Florida and parts of southeastern Coastal Georgia including Savannah. Graphic depiction of the center of Grayson on Thursday morning, January 4th, showing the pressure drop over a 24 hour period. 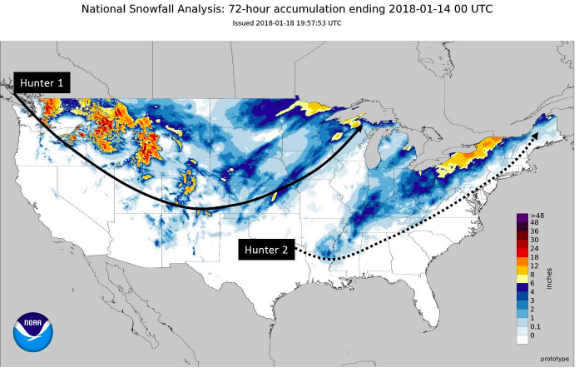 January 9-13, 2018 – A 2-Phase winter storm that brought a combination of snow and ice to a large swath of the U.S.
Hunter began as an upper level disturbance across the mountainous West, producing very heavy snowfall from the Washington Cascades through the Bitterroots. As Phase I worked its way northeast through the Upper Midwest, winds gusted to 76 mph in Garden City KS, blizzard conditions developed in parts of North Dakota and along with a half foot of snowfall a 15 mile stretch of I-29 north of Fargo to the Canadian Border was closed. Phase II of hunter developed over the Mid-Mississippi Valley and headed north in a somewhat unusual route along the Appalachians through Interior New England. Across Tennessee and western Kentucky areas experienced a lethal mix of freezing rain, sleet and snow that produced massive traffic accidents. A portion of I-40 in western Tennessee was closed for several hours due to several accidents. 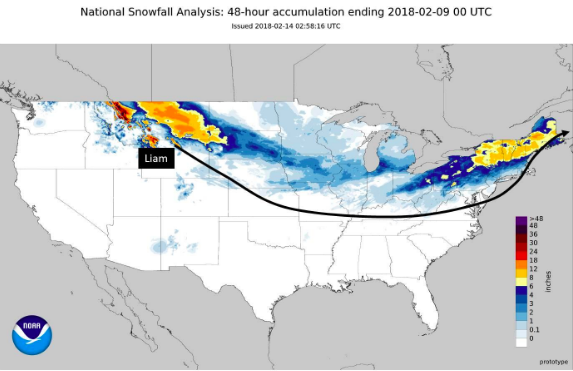 The “inside runner” track of this storm brought very heavy snowfall to parts of the Ohio Valley and the Lower Great Lakes, an area more familiar with heavy lake-effect snow. Bellevue OH got 22.3” of snow, Penfield, NY 16” and much of Western New York picked up over a foot of snow. Meanwhile, that inside track meant warmer conditions along the East Coast. That resulted in very heavy rainfall which led to widespread flooding over much of New England. January 15-18, 2018 – Another 2-Phase winter system that brought heavy snowfall from the Great Lakes and Midwest through New England and across parts of the South. 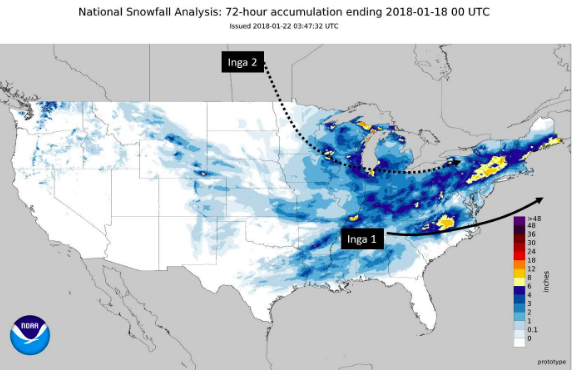 Inga was more of a moderate snowstorm for the winter-savvy Northeast, producing as much as 11” of snow in Maine and Massachusetts, with reports of 6-10” in other parts of New England, Upstate New York and Pennsylvania. However, by far its biggest impacts were across the South, being the third winter system for some locations through January. Freezing rain occurred in many Texas population centers including Austin, San Antonio, Dallas and and Houston. Reports of sleet drifting to a ½ foot were received in parts of Houston. Freezing rain was even reported in Brownsville, resulting in icy roads. Snow once again occurred in Florida from Panama City to Destin. Farther north in Atlanta, 2.3” of snow was recorded at the airport, shutting down the city and delaying flights for hours. Farther north in western Kentucky and adjacent Arkansas a band of snow produced as much as 9” accumulations. As Inga moved through the Carolinas, nearly 5” occurred in South Carolina and up to 12” in Teer North Carolina. 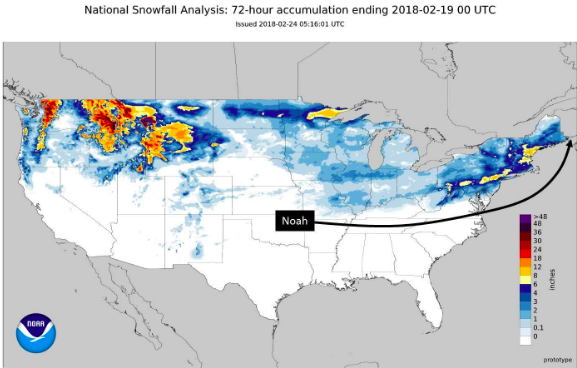 January 19-23, 2018 – A cross-country storm that resulted in blizzard conditions for parts of the Plains. Jaxson started its journey coming onto the West Coast where it produced heavy high elevation mountain snows over the Cascades. It moved southeast and dropped up to 20” of snow in Utah’s Wasatch Mts. Parts of Salt Lake City’s metro area picked up to a foot of snow. As it re-emerged as a Colorado Low, it deepened rapidly and charged northeast toward the Upper Great Lakes. A combination of heavy snowfall and strong winds resulted in whiteout conditions in Nebraska where even the plows were pulled of the roads. There were even reports of thundersnow in Nebraska from Jaxson. Farther north in Minneapolis, 12.4” of snow fell, the most since a storm back in December 2010 that collapsed the Metrodome. Portions of the major west-east interstates all closed from Jaxson including I-70 in Colorado/Kansas, I-80 through Wyoming into Nebraska, and I-29 in South Dakota. Finally as Jaxson tracked across Southern Ontario and into Northern New England it produced areas of sleet and freezing rain with accumulations of a 1/3 of an inch in some areas. This resulted in downed power lines across portions of Interior New England. Up to 8” of snow fell in far northern Maine near Caribou. 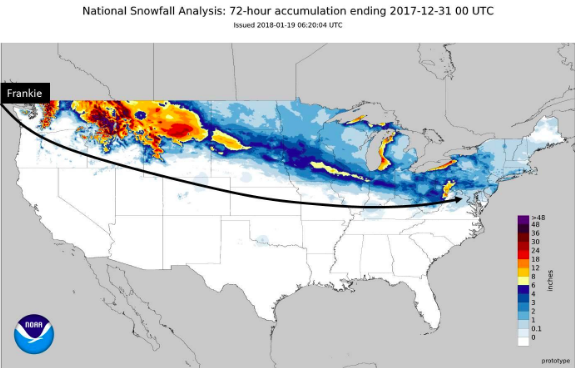 January 29-30, 2018 – Quick moving system that produced moderate snowfall from the Midwest through East Coast. Kalani developed over the Midwest then moved rapidly east across the Ohio Valley and off the New Jersey Coast before turning northeast toward the Gulf of Maine. Small scale banding of snowfall across Lower Michigan resulted in some impressive snowfall totals with as much as a foot near Flint, MI. As the storm exited the coast of the U.S. off New Jersey it provided one more punch of wintry weather, dropping 6” of snow on Long Island, then 6-8” in Southeast New England. Cape Cod once again felt the brunt of strong winter winds, Woods Hole gusted to 53 mph as the storm passed by to its east. February 6-8, 2018 – Long track system, greatest impacts for the Northeast. Liam produced some heavy mountain snows across the northern Rockies, then light to moderate snow across the Midwest. However, when it got into the Northeast it ramped up once again to produce bigger impacts for highly populated areas of New England. 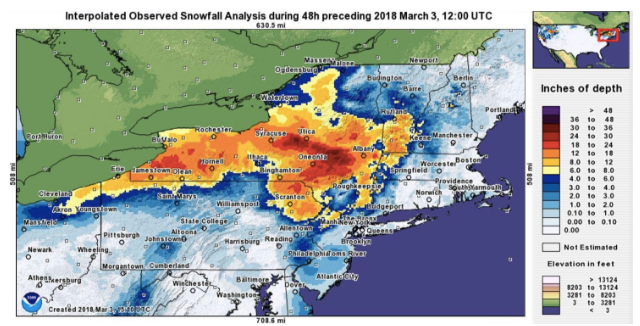 Parts of Upstate New York picked up 6-8” of snowfall, but it was Interior New England that saw the biggest snowfall and greatest travel impacts. As much as a foot of snow blanketed parts of New Hampshire and Vermont and 15” occurred in Bethel Maine. To add to the travel woes, areas from southern New England all the way south to parts of the Ohio Valley around Cincinnati had a mix of freezing rain and sleet, with ice accumulations enough to result in serious travel issues. There were even ice reports from Liam as far south as Arkansas and Oklahoma. February 8-11, 2018 – Snow throughout the Northern and Central Rockies, heavy snow for the Midwest and some icing farther south. After putting down 13” of snow in Havre MT, and even some freezing rain in Billings, MT, the system moved southeast and set its sights on the Midwest. Chicago officially recorded 12.3” of snow from the storm in two bouts of snow. In Michigan as much as 15” of snow was reported in Dowagiac and 6.7” in Detroit. Iowa recorded as much as 11” of snow and parts of Nebraska 13” leading to a lot of traffic issues across the state. In Missouri, ice was the issue, only a couple tenths of an inch was recorded but that was enough to cause many road crashes there. 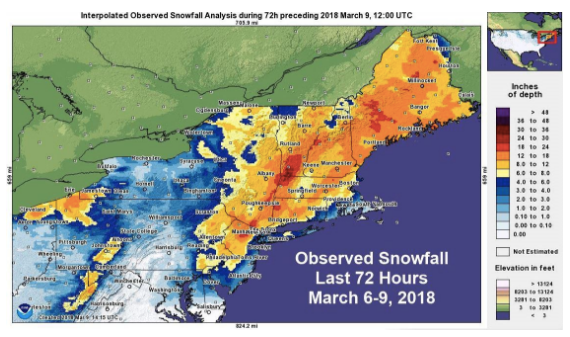 February 16-17, 2018 – Fast moving little storm system that dumped a brief period of moderate to heavy snow for parts of New England to the Mid-Atlantic. Noah tracked eastward from the Mid-Mississippi valley off the Mid-Atlantic Coast, then veered northward to the Gulf of St Lawrence. 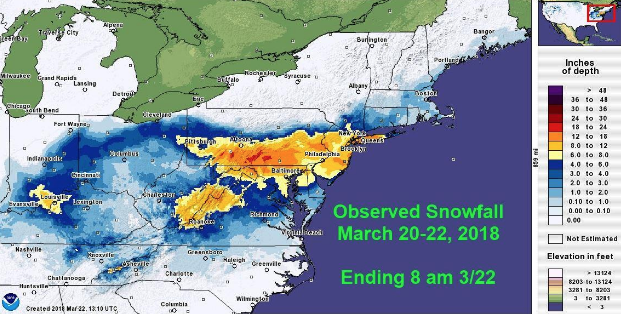 After a February thaw for much of the Northeast, Noah delivered as much as 9” of snow in parts of New Jersey. The I-95 corridor received its share of snowfall. In New York City, Central Park recorded 4.4” and there was even 1-3” of snow from Washington DC (Dulles) to Baltimore. Farther north through parts of New England 8-9” of snow piled up, at the NWS office in Gray, Maine, 9.9” was recorded. 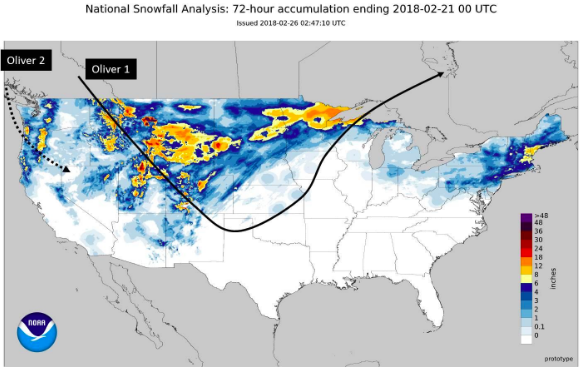 February 18-20, 2018 – Multiple Phase winter storm that brought rounds of wintry weather to the West through Rockies and Upper Midwest. Oliver was a complicated storm system that produced multiple rounds of wintry weather. The Northern Rockies and Bitterroots picked up as much as 2-4 feet of snow, adding to an already hefty snowpack for that part of the world. To the south, there was a lethal combination of cold air at the surface and warmer air aloft to result in an icing setup. Freezing rain and sleet covered a region from Kansas City south through Oklahoma and Texas, and eastward through Missouri and Illinois. A second round of wintry weather developed over the Pacific Northwest where Portland, OR picked up a very quick 3-5” of snow, almost an inch of snow fell in just 30 minutes in Portland. The foothills of the Cascades recorded as much as 8”. 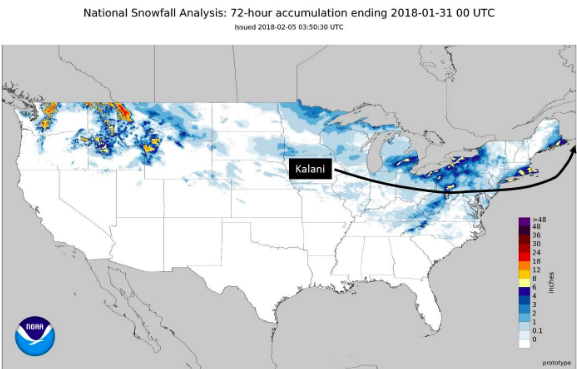 February 23-25, 2018 – Two-Phased storm that brought very heavy snowfall to the West and significant snow to the Upper Midwest, then Part 2 glanced the Northeast with snow as well. Polly came onto the West Coast, then took a southeast track across the Southwest, resulting in a relatively rare snowfall for snow-starved places like Flagstaff, AZ where they recorded their greatest 1-day snowfall of the season at 7”. Polly next crossed the 4-Corners Region of the US dumping 5” of snow on Salt Lake City and over a foot in the nearby Wasatch. 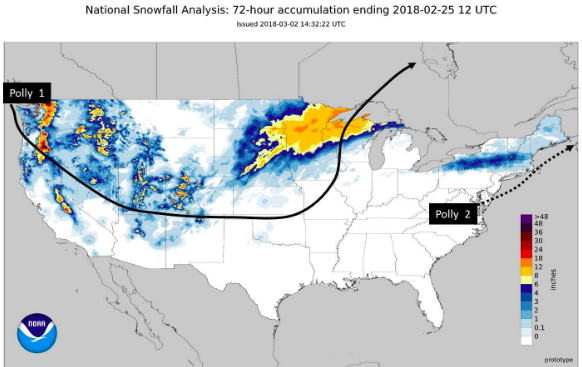 Polly then “flew” toward the Upper Midwest where it dumped a ½ foot of snow in Minneapolis and 10” in Duluth, their second highest storm total of the season. Finally, as the parent Low from Polly headed into Canada, a second Phase of the storm developed near the Delmarva Peninsula and quickly headed northeast past Cape Cod. The warm tongue of Atlantic moisture that it circulated back across New England interacted with cold air in place to produce a round of wintry mix of snow and some ice from New England back across parts of Upstate New York. February 28 – March 8, 2018 – Long track cross country storm, longest lasting winter storm of the season. One of 4 consecutive nor’easters to hit during the month of March. Quinn began its onslaught in the West as it lumbered along slowly, dumping as much as 6 ft. of snow across the snow-starved Sierra. 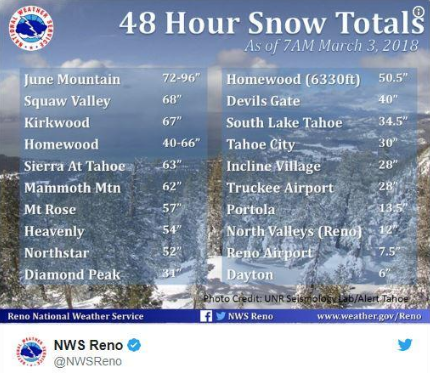 It was the biggest winter storm for the Sierra of the season. Kirkwood ski resort got and 81” storm total. Winds gusted as high as 130mph at the summit of Squaw Valley creating blizzard conditions. The main artery of I-80 closed due to the high winds and heavy snowfall. Quinn continued eastward across the Rockies, winds gusted over 70mph from Utah through Wyoming where several semis were blown over. Salt Lake City received 8” of snow, some of that from Great Salt Lake-effect. Farther east across Glasgow, Montana, 13” of snow fell on March 4, the 2nd highest one-day snowfall on record going back to 1894. Pierre South Dakota reported blizzard conditions for an astounding 10 hours straight! Wind gusts to 70 mph pummeled South Dakota. Minneapolis picked up 4.6” of snow officially, but strong winds caused whiteout conditions during evening rush hour. Most storms like Quinn will continue to track northeast into Canada. However, a blocking High anchored over Central Canada deflected the system so that it jogged southeast, then east through the Great Lakes then weakened. Part 2 of Quinn ramped up very quickly along the Mid-Atlantic Coast, then deepened very rapidly as it moved just offshore past Long Island and Cape Cod to the Gulf of Maine. Snowfall rates of 3” per hour were reported in New England along with thundersnow. 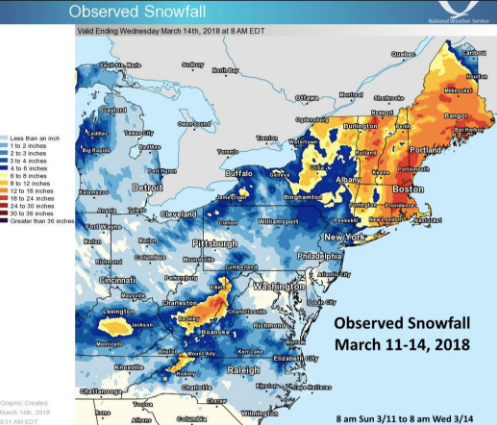 Snowfall totals of as much as 36” blanketed New England. Winds also gusted to 50 to 60 mph along coastal New England leading to hundreds of thousands without power. 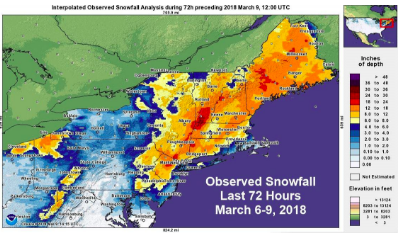 March 1-4, 2018 – Another “bombing” Low that produced exceptionally strong winds along the New England Coast and feet of snowfall across Interior New England. Riley actually hit New England before Quinn, which was named earlier as it lumbered across the West. Riley was a mean storm, developing over the Lower Great Lakes, then moving eastward before explosively deepening as it moved off the New Jersey Coast. Instead of taking a more northeasterly track like many storms that deepen in this fashion, Riley wobbled a bit then headed east-southeast out to sea where it stalled in the western Atlantic producing an extended period of strong onshore winds. As Riley moved off the New England Coast late March 1st, the central pressure of the Low dropped 24mb in 21 hours, achieving the “bomb” status (24mb in 24 hours). Snowfall was significant with as much as 39.3” reported in the Catskills of New York near Cobleskill. The easterly track of the storm also dropped very heavy snow across most of Western and Central New York with 25.4” reported east of Buffalo in Wyoming NY in 24 hours. They also reported thundersnow there. By far however, the greatest impacts from Riley were due to the exceptional winds. An astounding 4 locations on Cape Cod reported wind gusts in excess of 90 mph from Riley as the system took a perfect track to batter the Cape with strong onshore flow. Six states reported wind gusts of at least 70 mph. Dulles airport in Washington DC reported wind gusts in excess of 50 mph for 12 hours straight. More than 1.9 million people were without power at one point from the Mid-Atlantic through Northeast. Coastal flooding once again hammered the Massachusetts coastline including Duxbury and Scituate. The flooding lasted for the better part of 2 high tide cycles. In Boston, they got to their 3rd highest high tide on record, topped only by February 1978 and just 2 months before this storm when Winter Storm Grayson set the record back on January 4, 2018. March 11-14, 2018 – 3rd nor’easter for the month, 2-Phase system, first tracked a bit farther south than the other nor’easters, Phase 2 a bit farther off the New England Coast. Next up in the Nor-easter onslaught was Winter Storm Skylar. Another storm that met “bombogenesis” criteria, Skylar dropped its central pressure 28mb in 24 hours. Another two-phase snowstorm, Phase II of Skylar developed off the Carolina Coast and took a track just outside the “benchmark” (40°N 70°W) allowing for cold air to make it all the way to the coast in New England. As a result very heavy snowfall accumulated in places like Boston, Providence and Portsmouth. Parts of 7 states recorded at least 20” of snowfall. Falmouth, MA once again got hammered by strong winds with gusts to 81mph at one point and even Boston’s Logan airport had several gusts in the 30-50 mph range. The combination of heavy snow and strong winds created blizzard conditions that impacted 10’s of millions including New York City, Long Island, Boston. Other parts of Southeastern New England and on Long Island snowfall rates exceeded 3” per hour. With cold air locked into the Mid-Atlantic region ahead of the storm, snow accumulated all the way down through North Carolina. 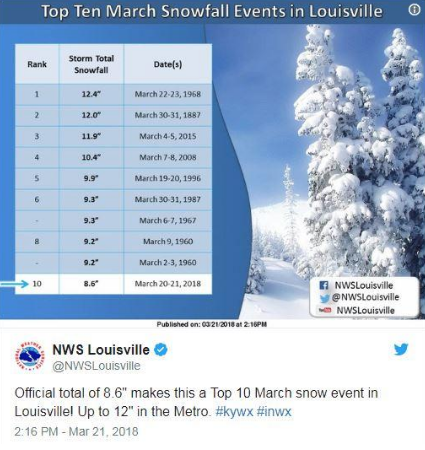 Lexington KY picked up 10.5” of snow from Skylar, their average annual snowfall is only 12.6”. March 19-22, 2018 – 4th nor’easter in 3 weeks, in March! 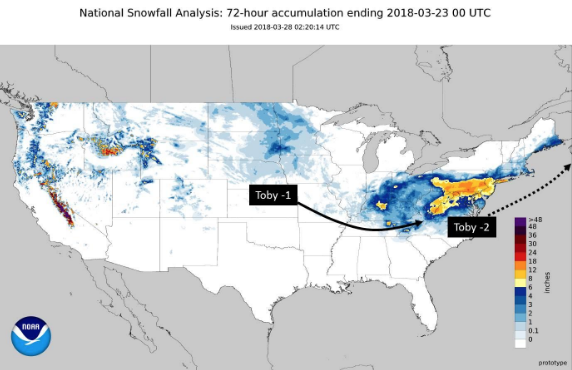 Toby took the farthest south track of the series, bringing heavy snow to the Mid-Atlantic too. Finally, rounding out the quartet of Nor’easters was Toby. This Nor’easter took more of a southern track in two phases once again, the first through the Central Appalachians, then Phase II was coastal development off the Delmarva peninsula and a track to the east of Cape Cod. 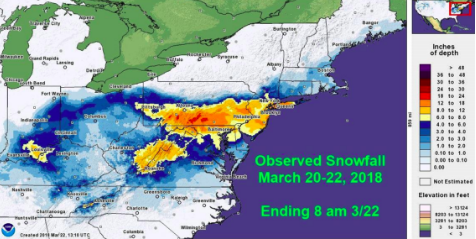 As a result of the more southern track, the first day of Spring provided the 2nd heaviest late season snowstorm in Harrisburg, PA (14.2”) and heaviest Spring snowstorm in 60 years in Philadelphia (7.6”). Washington DC saw 4-6”, their heaviest snowfall of the season. Enough cold air was in place over Kentucky so that Phase I of this storm dropped nearly a foot of snow in the suburbs of Louisville as well. Their average annual snowfall in Louisville is 13.6”. Once again the combination of heavy, wet snowfall and strong winds from this Nor-easter resulted in power outages to over 100,000 customers. Coastal flooding was also reported yet again in Scituate, MA. However, because of exceptionally dry air over much of New England, there was not much snowfall there. 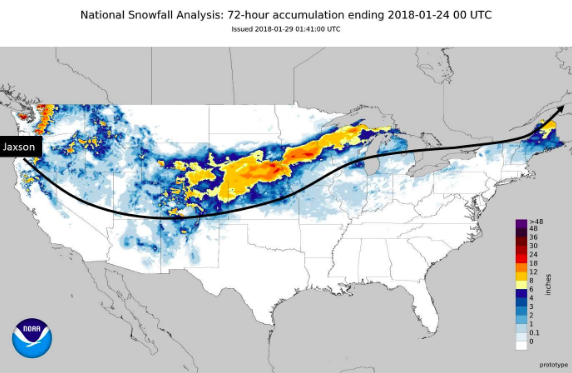 March 23-25, 2018 – Very narrow band of heavy snowfall from the Northern Plains through Midwest to the Central Appalachians. 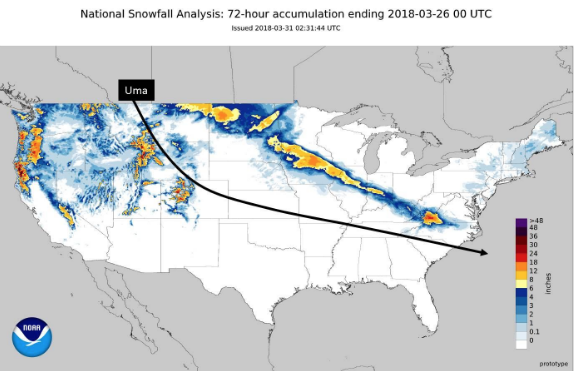 Uma was a fact moving winter storm that produced a very narrow swath of heavy snowfall as it moved southeast across the nation. A foot or more snowfall occurred from Minnesota through Iowa and Illinois. Indianapolis reported 10.2” of snow which made it the greatest 2-day snowfall since January 2014 and the 2nd highest March 1-day snowfall on record. Ironically, 15 miles to either side of that snowfall maximum barely any snow fell. Once the system cut across the Central Appalachians, the added lift squeezed out as much as 17” near Bluefield, WV making the skiers happy. 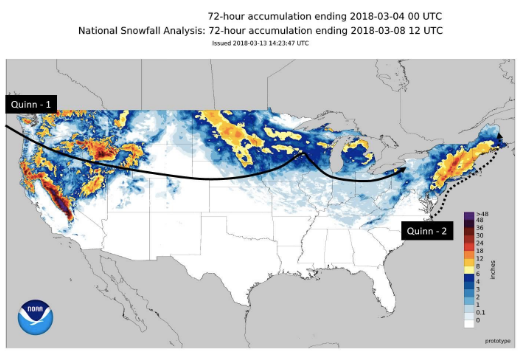 March 30-31, 2018 – Quick hitting “border runner” that brought heavy snowfall to the northern part of the Upper Midwest and UP of Michigan. 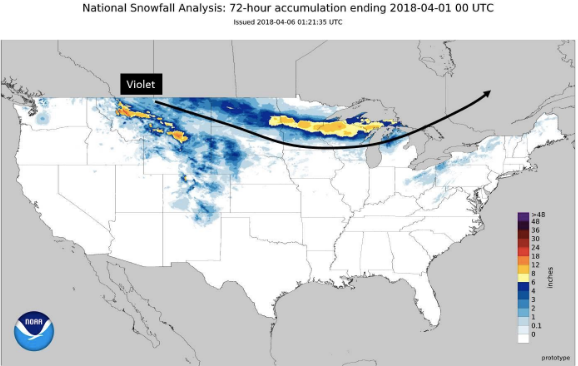 Violet was a fast-moving “clipper-esque” system that brought a round of heavy snowfall and strong winds to parts of the Upper Midwest and the UP of Michigan. This system had a lot of wind, with gusts as high as 68 mph at rapid City SD and 72mph at Garrett WY. Portions of Central Montana saw whiteout conditions due to the combination of wind and snow. Top snowfall for this storm topped a foot with 12.8” in Bruno MN. In northern Wisconsin, 11.5” feel near Hayward. On a secondary note, ranchers across parts of South Dakota were concerned with this late season snowstorm because of the potential of impacting newborn calves at this time of the year. 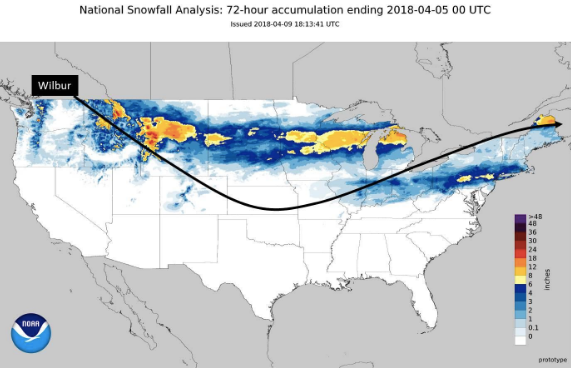 April 2-4, 2018 – Another fast moving “Clipper-esque” type storm that brought snow from the Rockies through Upper Midwest and even parts of the northeast. Wilbur was one of our April snowstorms that took advantage of the cold air that was locked over the Northern Tier of the nation through April. As the storm tracked east across the nation, a swath of heavy snow developed to the north of its track. As much as 19” of snow fell in Montana and northern Wisconsin picked up to 12.3” of snow. 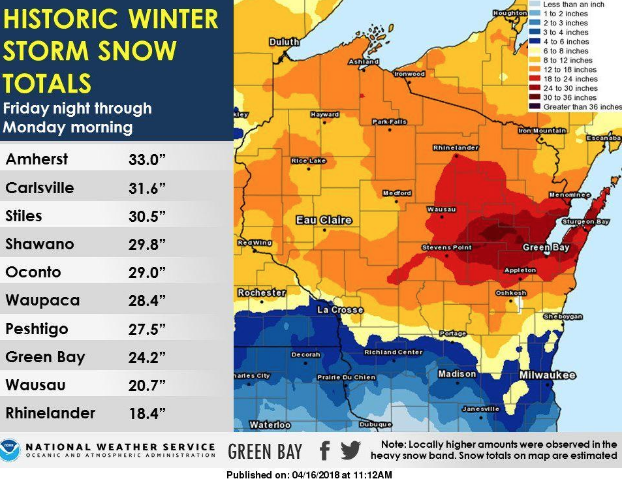 Green Bay recorded 8.1” which up to that point in the season was the greatest 1-day snowfall they received (little did they know the worst was yet to come with Xanto). Minneapolis picked up a 2-day total of 9”, the greatest 2-day total after April 1st in almost 34 years! 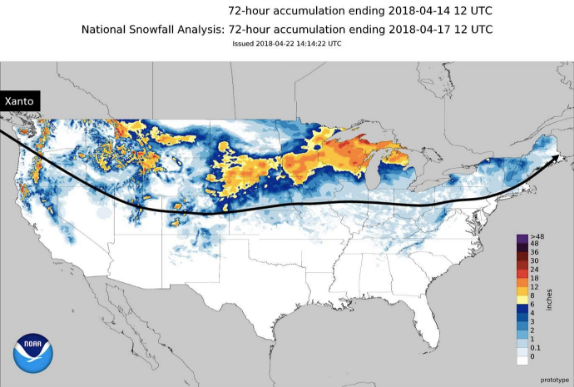 April 11-17, 2018 – A slow moving west to east giant that produced record snowfall for April across parts of the Plains through Upper Midwest. Xanto showed that even in April, winter storms can be ferocious. This slow moving monster started off on the West Coast of the U.S. with very heavy snowfall through the Cascades to Bitterroots and Northern Rockies. Near Bozeman, MT 25” of snow was reported. However as the system came off the Rockies, it slowed its eastward movement, taking the better part of two days to travel from Eastern Kansas to central Illinois. That eastward track was modulated to some point by a stationary, strong, cold, blocking high across Southern Canada. This setup was perfect for an extended period of moderate to heavy snowfall to the north of its track and it didn’t disappoint. Blizzard conditions occurred in South Dakota and western Nebraska with thundersnow and snowfall rates up to 3” per hour in parts of South Dakota. Blizzard Warnings had been issued for parts of 6 states including South Dakota, Colorado, Nebraska, Kansas, Iowa and Minnesota. Xanto set all sorts of records for snowfall across the Upper Midwest. It was the heaviest April snowstorm on record for the Minneapolis/St. Paul area with 15.8” of snow from April 13-16. Better yet, in Green Bay, Xanto dumped an incredible 24.2” of snow from April 13-16, making it the 2nd greatest snowstorm on record in any month. Green Bay’s average monthly snowfall for April is only 2.9”. The highest monthly snowfall total for April had been 15.1” set back in 1907! The highest snowfall total from the storm was 33”, from Amherst Wisconsin. Illinois did a good job a dogging the bullet. we got his by about 5 storms while about 6-8 missed us! less snow for me to shovel.